Providence Animal Center is set to hold two fundraisers this month. A cocktail evening and a luncheon all in the name of raising awareness and funds to save and care for homeless and neglected pets. 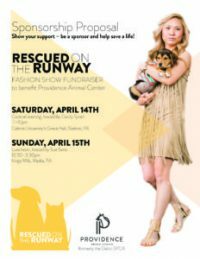 Saturday, April 14: An evening of two- and four-legged fashion and cocktails at Cabrini University all in the name of raising awareness and funds to care for homeless and neglected pets. Every ticket includes access to an open bar, food, a fashion show hosted by 6ABC’s Cecily Tynan featuring looks by elan as well as adopted and adoptable pets, a silent auction and a beer and wine raffle. Can’t make Saturday? There is a Sunday luncheon. Sunday, April 15: An afternoon of fashion and food at Kings Mill all in the name of raising awareness and to save and care for homeless and neglected pets. Every Luncheon ticket includes a 3-course meal, a fashion show hosted by Fox29’s Sue Serio featuring looks by Sorella and H. Rose Botique as well as adopted and adoptable pets, a silent auction, wine raffle and a cash prize raffle. To purchase tickets for either of these events, click here.